In addition to describing walking trails around the world, Bain includes a list of 10 great Australian treks. 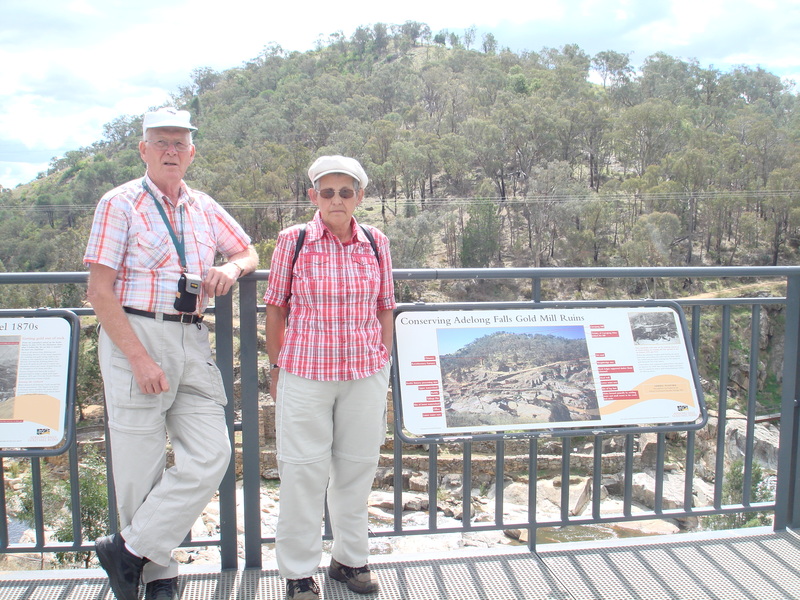 Maria and Paul will be walking in Rotorua (19-20 March) and in Canberra for the fifth time this year. Their previous visits were in 1999, 2006, 2010, and 2013. The couple live in the Province of North Braband, in the township of Deurne, a municipal area comprising several small towns and approximately 30,000 residents. They had already been walking in international events throughout Europe before the IML was established in 1986. “Our scope of international walking was extended once we joined the IML,” Paul notes. “Apart from Israel, China, Indonesia, and Lithuania, we have walked everywhere there is an IML walk.” Some of those countries include Canada, Japan, Korea, Taiwan, and the United States. The pair walk regularly in certain locales such as nearby Nijmegen where Maria has walked 42 times and Paul 27 times. When Paul is not walking, he sets up his caravan beside the day four route and offers drinks to the walkers. They have also walked more than 30 times in Belgium, Switzerland, and Luxembourg. In 2014 they received their IML 150 medal award [for completing 450 walks] in Fulda, Germany. At home, they have been members of the Limburg area of the KNBLO, the national walking association of the Netherlands, since 1961. The Royal Netherlands Walking Association organises the Nijmegen Four Day Walk which will celebrate its 100th event this year on 19-22 July. Walkers may choose from 30, 40 or 50 kilometre routes each day. 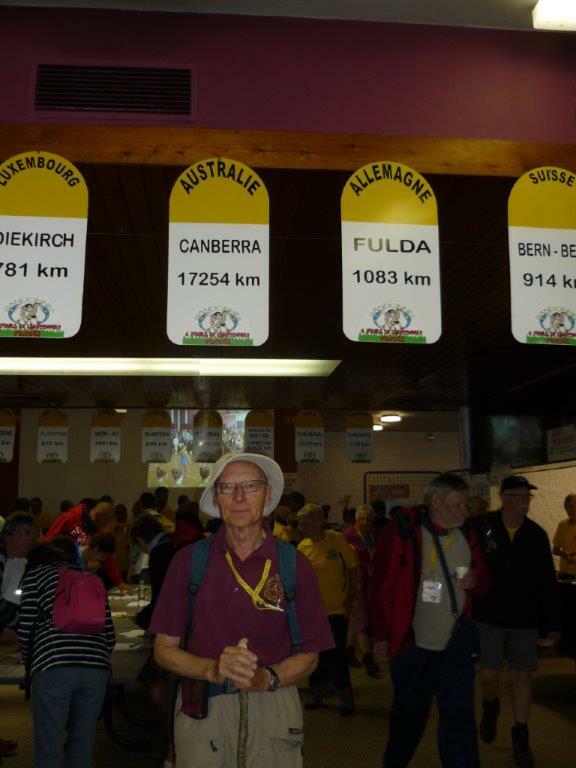 They have been members of the Wiehengebirgsverband Osnabruck in Wesser, Germany, for 48 years, and the Fulda Walk Club in Germany for 19 years. The duo even led their own walking group from 1961 to 1993. 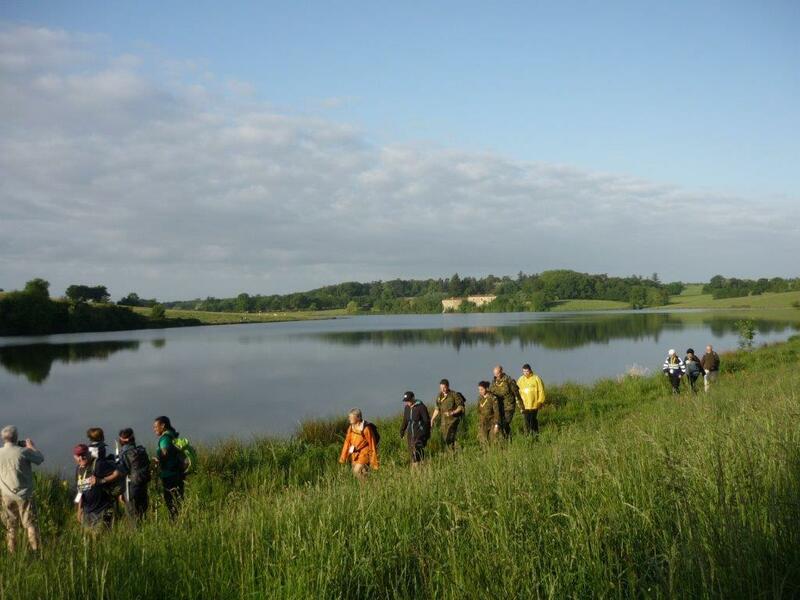 “Apart from normal walking events, we also do long distance walking. Our longest trek was from Deurne to Lourdes in southern France where we walked about 1,300 kilometres over 40 days with a full backpack,” Paul adds. Long distance walking usually features routes of 160 kilometres or more over a number of days. There are also events like the Kennedy Marches where walkers must complete 80 kilometers within 20 hours. When they aren’t walking, they enjoy bicycling. “In our younger days we also did a lot of swimming,” Maria recalls. She volunteers with the Red Cross while Paul assists numerous people with completing their tax forms and answering correspondence. 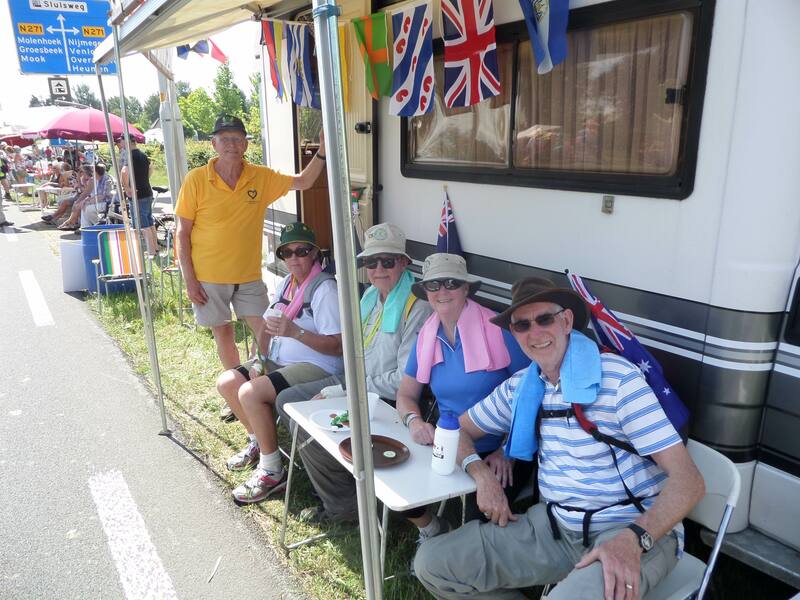 Four Australian walkers enjoying Paul’s hospitality during the Nijmegen walk. IML walker Anthony (Tom) Buykx has participated in 18 of our C2DW events. He has also walked in 20 other IML countries including Austria, Belgium, Canada, Czech Republic, Denmark, England, Finland, France, Germany, Ireland, Italy, Japan, Luxembourg, New Zealand, Norway, South Korea, Switzerland, Taiwan, the Netherlands, and the USA. A walker for over 60 years, Tom enjoys the IML walks for many reasons including his friendship with other walkers, a sense of achievement at the end of each walk, the experience of visiting other countries and his collection of IML medals and awards. A member of the Catholic Walking Club of Victoria, a bushwalking group, he has completed more than 20 walks with his club so far this year. An earlier version of this story appeared in the August 2015 edition of the Catholic Walker, the CWCV newsletter. R4JCV, the Randonnee de 4 Jours en Chantonnay Vendee, is a four-day IML walk around Chantonnay in the Vendee department of France. Chantonnay is a country town (about 8,600 inhabitants) in western France, about 1 and 3/4 hours by train and bus from the historical city of Nantes. Every year, commencing on Ascension Thursday (a public holiday in France), the town is host to walkers from all over Europe, with a sprinkling of visitors from further away. I think I was the only one from down under in 2015. Earlier this year, at the IML walks in Rotorua and Canberra, I had met a French walker who rekindled my interest in the Chantonnay walks which I had done once before, in 2008. And so I arrived in Chantonnay on Tuesday, 12 May 2015. Because I had made my travel arrangements fairly late, I had been unable to get accommodation in town. Thus I finished up in a hotel five kilometres out of town, in a wonderful setting on the shore of a lake. In this hotel I happened to meet the same Frenchman again. He kindly offered me transport to and from the start/finish. Each day there were five routes, three of which qualified as IML walks. I opted for the 21km/day routes. The walks all began well out of town so each morning several buses lined up to take walkers to their starting points. The walkers’ guidebook showed very simple sketch maps of the routes, but they were all so well sign-posted that maps were not necessary. Alongside the narrower paths and tracks the grass had been cut to facilitate the walking and in a few fields a path had been cut through the growing crop. There was much variety in the countryside here: grassy meadows with cream-coloured cows, ploughed brown fields with young green plants coming up, here and there a vineyard, patches of forest, a lake, a stream. The country is quite undulating, the roads and tracks are often hedged with shrubs and trees, and if not hedged they provide lovely views. Every six or seven kilometres there was a rest area and/or checkpoint. The rest areas (“ravito” in the local lingo, an abbreviation of “ravitaillement”) were well set up with tables full of fruit, chocolate, brioches (a bakery product that is not quite bread and not quite cake, but very nice), muesli bars and drinks (but no cups!) all for free. Walkers had to provide their own cups, and to promote this the organising walking club sold quite nice souvenir cups for a few euros each. The entry fee was 24 euros. On Ascension Thursday, 14 May, we started from somewhere south of Chantonnay. It was overcast and there was some rain from time to time. Some of the tracks were quite muddy, but everyone seemed to cope with the conditions. The route passed only one village, and then really only its outlying houses. In the afternoon, the weather cleared up nicely. By then I had reached the finish in the local park, where walkers received a “sandwich”, a drink and an apple. The local brass band provided entertainment and the local traders had set up stalls to supply more food and drink. There was a happy atmosphere, just like we have in Canberra at the end of each day, but with many more people. I was glad to catch up with several walkers whom I had met on previous IML walks in other countries. On Friday, 15 May, the buses took us to a point west of Chantonnay. The first part of the walk was along the forested edge of a large artificial lake. There were people fishing in the lake and camping on the shore. Fishing and hunting are popular pastimes in France — along the tracks I often noticed signs advising vigilance in the hunting season. The second “ravito” was in the grounds of Chateau l’Auneau where the owner had three vintage cars on display. This property and several other areas we walked through were clearly marked as only open for the day of the walk. After my return to the park I watched a local folk dance group, mostly senior citizens, go through their elegant paces. I met up again with my French friend, but now to say “au revoir” because he had to be home over the weekend. To get back to my hotel, and for transport on the Saturday and Sunday, I had already put the hard word on the driver of a busload of Belgian walkers and he readily allowed me to travel with them. Yes, walking unites us — “nos jungat ambulare” is the motto the IML. On Saturday, 16 May, we commenced our walk somewhere northwest of Chantonnay. In anticipation of a forecast sunny day I had bought sunscreen in town, but it was overcast all day. The day’s route was through gently undulating farmland with fields of wheat, barley, oats, rye, and canola. It was very open country and I did not mind the cloud cover. There were two villages on our route, but, as the other day, we did not go through them, only their outskirts. I think it might have been nicer to walk through the village centres, to see their streetscapes, squares, churches and Saturday busy-ness. At one point we came to and walked alongside a railway line until we had to cross. it. A marshal was stationed here to guide us. There were two ways to do it, he said, but one of them was illegal — over the embankment and rail track. The other was through a culvert under the line. There were steps to get into and out of it, but with only about 1.2 metres [four feet] from wet floor to stony ceiling it was not easy to get through. I was not the only one to knock my head painfully. The day’s entertainment in the park was provided by a dance group from Barcelona, a city only fairly recently admitted to the IML. There was also a stall where one could sample Spanish goodies, sausages and wine, a good promotion for their walking event. On Sunday, 17 May, we had our first perfectly sunny day which was wonderful. We were taken east of Chantonnay and started walking at Lake Rochereau. The water was very still with lovely reflections, including those of Chateau Launay. After crossing a tributary flowing into the lake we made our way up to the chateau and the first “ravito” for the day in a barn in its grounds. Once again we skirted the outer parts of a village, this one Sigournais, and eventually we walked back through the centre of Chantonnay to the finish. There were many family groups walking the shorter distances this day, obviously enjoying a good Sunday outing. At the finished I received a medal and a certificate and had my IML passport stamped. [Note: In all IML events the participant has to walk every day of the event. Most IML walks are run over two days, but some take place over three or even four days.] On the lawns of the park there were signs in the shape of old mileposts showing the names of other IML towns and their distances from Chantonnay. Of course, Canberra and Rotorua were the most distant. This afternoon the local pipe band (bagpipes are not exclusively Caledonian) made themselves heard, albeit not quite like the Scotch do it. The movie version of Bill Bryson’s 1998 book about his experiences walking the Appalachian Trail in the United States opens today 3 September in a theatre near you. For more info about this national scenic trail, please visit the U.S. National Parks website. An interview with Bill Bryson was featured in last weekend’s edition of the Sydney Morning Herald‘s Spectrum magazine. Inspired by the experiences of many other walkers from our group who have done the pilgrimage (some more than once! ), I walked the Camino in June. I had been planning to do the walk to mark my 50th birthday but once I started to think and read about doing the walk I had to do it this year. From Paris I took a train down to Bayonne where I waited a few hours before catching a bus to the traditional starting point of St Jean Pied du Port but, as I got off the train, another passenger saw that I was a pilgrim and he offered to drive me in his car to St Jean because he had been a pilgrim himself. 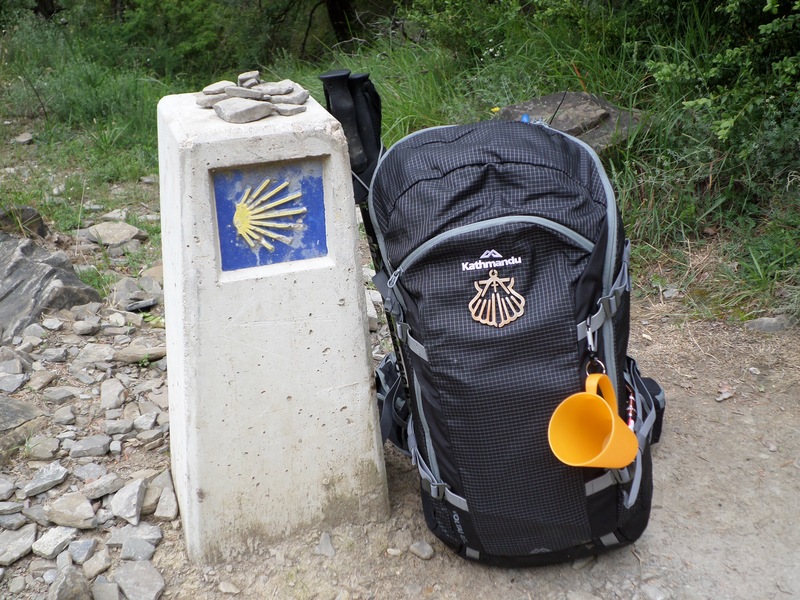 My first experience of “the Camino provides” occurred before I had even started! I had never been to Spain before (and do not speak Spanish) so was not quite sure what to expect. The countryside varies from flat dry agricultural land to beautiful green rolling hills and dark forests carpeted with ferns and mosses. I was fortunate to have good weather, largely overcast, with a few warm days and a couple days of rain. The worst parts of the walk were one night of bed bugs and getting bitten by a dog one day — but all Camino stories include bed bugs and dogs! I had a real sense of achievement once I had crossed the Pyrenees on the first day. I met many other pilgrims (some of us kept together, some we saw only for a day or two) and I was amazed at the size and ornate beauty of the churches in what are sometimes quite small towns. I was very impressed with the friendliness of the locals along the route and I always found people going out of their way to provide directions and assistance. 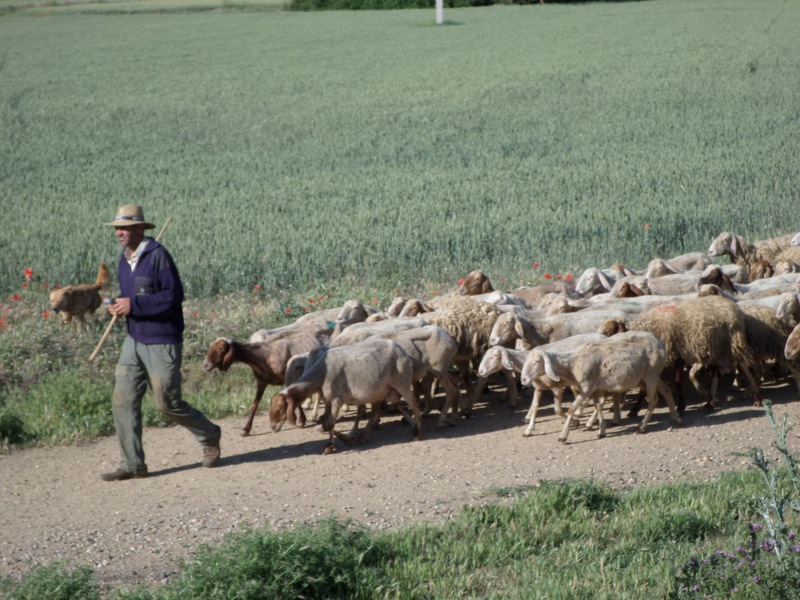 The path cuts through a number of villages and in some cases right through farms so you have a good opportunity to see rural life in Spain — always interesting to a veterinarian from the Agriculture Department! I greatly enjoyed seeing farmers with their flocks of milking sheep. I arrived in Santiago after 28 days with some time to spare so I walked on to the coast and visited the towns of Finisterre and Muxia. In ancient times, as today, pilgrims carried back home a scallop shell from one of these towns as a sign of having successfully completed their pilgrimage. To prepare for the Camino I increased my regular walking around Canberra and a few times I walked with my backpack loaded up with weights. A good piece of preparation was doing the St Clements pilgrimage from Yass to Galong over three days in April with others from my walking group. Most guidebooks recommend taking about 33 days to cover the almost 800km from St Jean to Santiago but I walked a little faster than this, averaging 30km a day. Initially I was not confident I could cover the distance in the time I had available. Later I found that on some afternoons there was no accommodation remaining where I had planned to stop and so I had to walk on further. Some days where I had planned to walk only 25km I ended up walking 40km. People walk the Camino for a variety of reasons. Some are true pilgrims carrying out a religious activity, others are interested in the exercise, or the sense of achievement, or in meeting new people. Some walk to have an extended period of time for free thought, or to recover from divorce or bereavement. I found it difficult to articulate why I was doing the walk when I was struggling with blisters, interrupted sleep or loneliness, but having completed the walk, I feel a real sense of accomplishment and confidence to do something similar in the future. 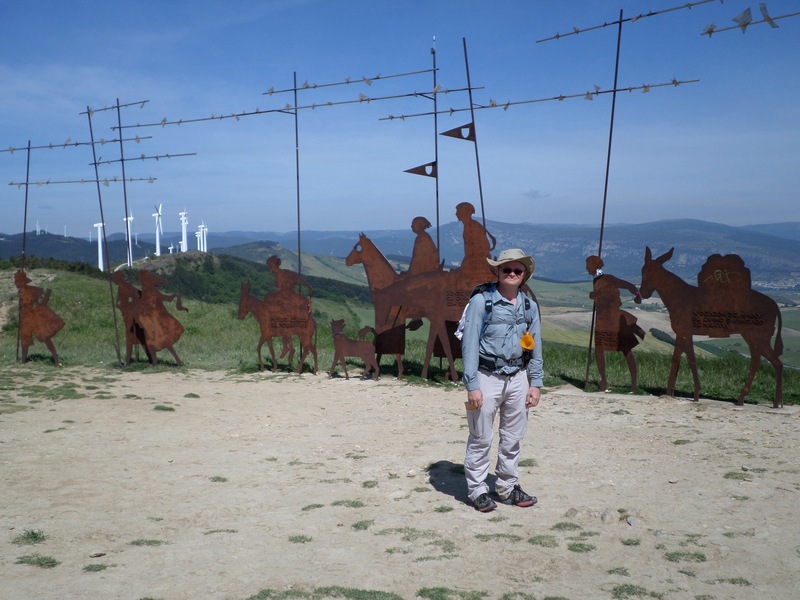 Mark Schipp, our vice-president, also walked the Camino during the northern summer. Here is part 1 of his story. The route became established in the 9th century and has been growing in popularity over the past 20 years, reflected and reinforced by documentaries, books and films about The Way. The remains of St James, one of the apostles, are said to be housed in the cathedral in Santiago. Popular pilgrimage years include those where St James Day (25 July) falls on a Sunday. Last year (not a holy year) 215,880 pilgrims received their compostela in Santiago, generally during the spring/summer/early autumn seasons. 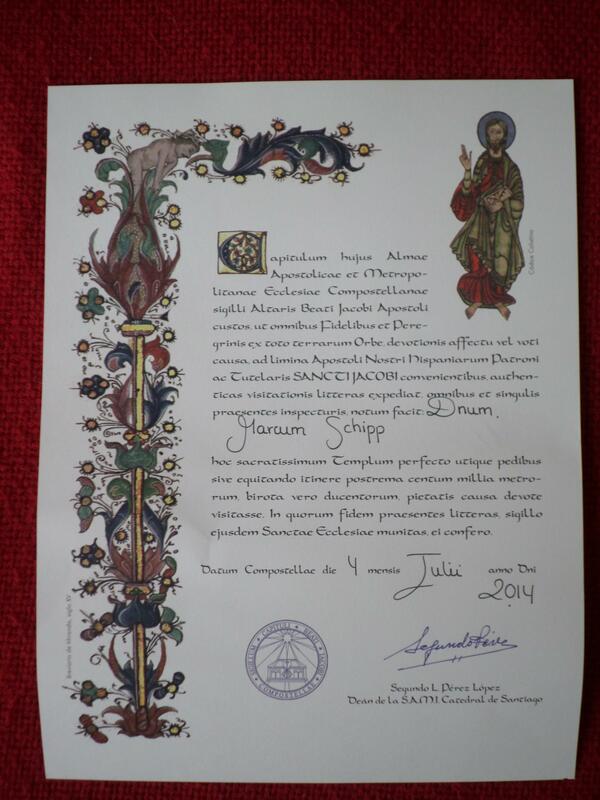 A compostela is a certificate showing that the pilgrim has completed at least the last 100 km of St James Way. Last year twice as many people walked only the last 100km rather than started from St Jean. Pilgrimage can be done on foot (87%), by bicycle (12%) or by horse (1%). Most walkers are over 30 years of age and there is an almost even split between the sexes. Australians are the 10th most common nationality on the Camino. The route is very well catered for as small villages are coming back to life in order to service the needs of pilgrims. Cafes, bars and albergues (dormitories) are popping up along the route. Most days there is a cafe or bar every 5 or 10km, although there are a few sections with longer stretches where the walker is advised to carry food and water. The route wanders through some beautiful scenery across the Spanish countryside, including ancient cities with magnificent cathedrals. Accommodation is usually in the form of bunk beds in dormitories and is relatively cheap at 5-12 euros per night. In some albergues you may cook your own meals while others provide a fixed price pilgrim’s menu (three courses, wine and bread for about 10 euros). So this is not an expensive holiday. To access these albergues you must show your credencial (pilgrim passport) featuring stamps of the places you have visited (a nice souvenior at the end of your trip). Your credencial is used in Santiago as evidence of your pilgrimage to obtain your compostela certificate. Most pilgrims carry their packs, decorated with a scallop shell, but some choose to use a service that transports your pack forward so you only need to carry a day pack. This is a very useful option if you have blisters or a steep climb ahead of you! The Way is very well-marked with yellow arrows pointing the direction and supplemented by the sign of the scallop shell along the route where it follows main roads and in more urban environments. There is a good mix of walking on formed paths, alongside crops or along the old Roman road. 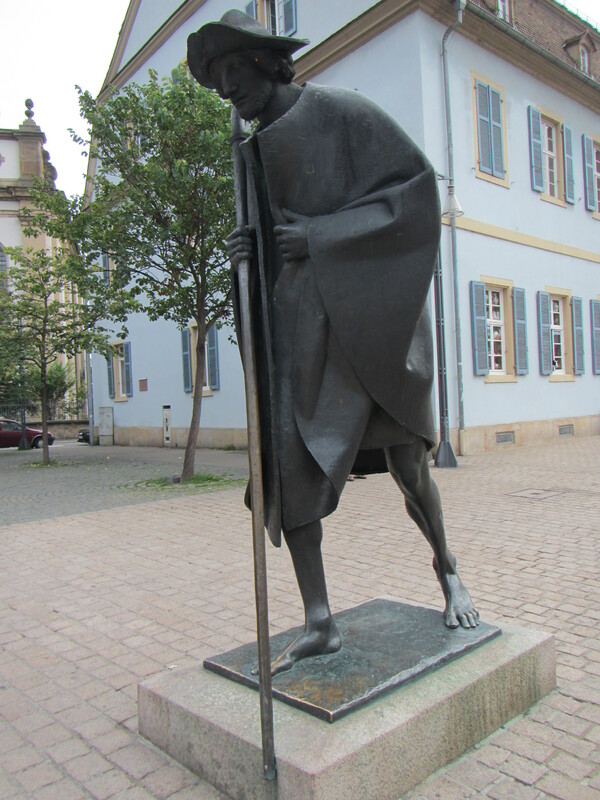 This bronze statue of a pilgrim walking the path of Saint James is just down the street from the Cathedral in Speyer, Germany. Harry and Kathleen Berg at the entrance to St Jean Pied de Port. 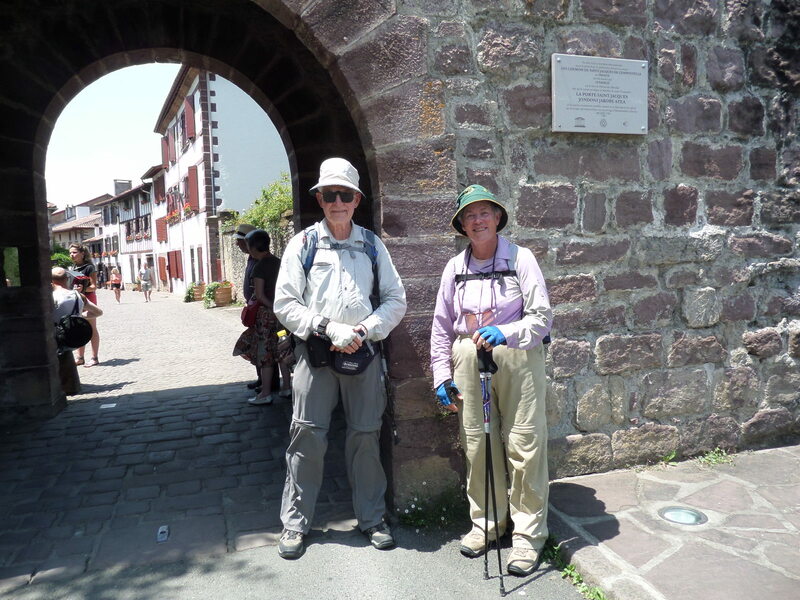 Harry and Kathleen Berg walked El Camino Frances from St Jean Pied de Port, in France, just north of the Spanish border, to Santiago de Compostela, Spain, in 2010. They walked about 780 km, over 34 walk days and 2 rest days. Like a few others they then felt they wanted to complete the pilgrim journey by also walking the Via Podiensis from le Puy en Velay in central France to St Jean Pied de Port. They did this second section in two stages — from le Puy en Velay to Cahors in 2013, and from Cahors to St Jean Pied de Port in 2014. In May 2013 they walked from le Puy en Valey to Cahors, about 340 km, in terrible weather, over 16 walk days. Except for one nice day, the maximum temperature was 8 degrees with rain — with or without thunder and lightning, and sometimes even snow. The Bergs were hoping for better weather this year for their walk (420 km over 20 walk days) from Cahors to St Jean Pied de Port where they had started in 2010. The weather was not so good for the first three days but then their prayers for better weather were answered — with a vengeance. Most days were 30 degrees C or above, up to a maximum of 36 degrees C.